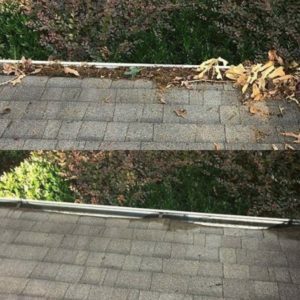 Fall is a great time to have your gutters cleaned. Leaves begin falling, clogging the gutters. Debris from the summer builds-up, keeping rain water from running through freely. This can cause some big problems – both now and in the future. Here are 3 reasons to clean your gutters in the fall. It prevents damage to your foundation – Gutters are designed to move the water from the roof to an area away from your house and foundation. If the water isn’t able to drain properly through the gutters, it will soak into the ground next to your foundation and over time this can cause some very expensive problems: The foundation can crack, water may leak into your basement, and it can also cause mold and areas of rot. It helps you avoid roof damage – water that pools on the roof because it can’t drain through the gutters properly can cause damage to the fascia as well as roof damage because the water can get backed up under the shingles. It helps keep mosquitoes away – insects, like mosquitoes, love standing, stale water and clogged gutters are full of just that. To avoid attracting flies and mosquitoes is a great reason to make sure you keep your gutters cleaned.Give us a call at 864-236-4071 or send us a message if you’d like to have a quote for gutter cleaning. Nichols Lawn Services is fully insured and qualified to do the job! It’s a small amount to pay now and can add up to big savings later by avoiding larger and more expensive issues.